Companies are increasingly seeing the benefits of using a travel management platform for booking flights and hotels. This way, their employees are able to use a single platform for all their corporate travel needs, making it easier for them to book, manage and track every part of their trip from one place. Employers benefit as well — they get access to better deals and can more easily keep track of the company travel budget. But while implementing a travel management platform is often a step in the right direction, it comes with its own set of problems. According to a study performed by travel industry research authority Phocusright, most travel platforms observe attachment rates of under 50%. This means that employees might book a flight through the platform, but then take care of their lodging off the platform. Most travel platforms observe attachment rates of under 50%. This puts your company at risk. Why do attachment rates matter? You might be wondering why it makes sense to use the user attachment rate as a leading metric — especially when there are so many metrics to assess the performance of a travel platform. Low attachment rates means that employees aren’t using the platform, and are instead managing travel on their own. As it turns out, this can often be linked to bigger underlying issues, which are worth exploring on their own. What’s the reason for low attachment rates? There’s a mix of different reasons why employees aren’t booking their entire trip on the same platform, but a couple of them stand out. Take for example the platform’s usability — while it’s often overlooked when creating the platform, it’s actually one of the most important things to influence how people use the product. Your developers might have implemented incredibly powerful features that work great on paper, in real life your users could end up being confused how to login. A well-designed booking platform is easy to use for people who are comfortable with technology, but also for the less digitally inclined — and this is definitely an area that most platforms could improve in. Another reason is that some platforms severely limit their users in their choices, only giving them a handful of options to pick from. This is particularly bad when it applies to lodging options, as deciding where to sleep can be a very personal decision — for example, some care about having a luxurious hotel experience while others crave the authenticity of an AirBNB. If they can’t find something that suits their liking, employees are inclined to look outside of the platform on public booking engines, making for a sharp drop in attachment rates. If they can’t find something that suits their liking, employees are inclined to look outside of the platform. When your attachment rate is dropping there’s clearly something wrong with the way your travel program is set up — and the consequences for your company could be severe. Most importantly, there’s the financial aspect. When people are booking elsewhere, your company is making losses on a couple of things. One of these comes from the fact that it’s impossible to bargain for good deals with hotel chains and travel agencies when nobody is actually booking through your engine. Something that could end up costing a lot more are the processes that follow the outside booking. They can stack up to become quite expensive, as the payment first needs to be submitted as an expense, then processed by the right department and finally reimbursed. This involves hours of work by various teams and it ends up as an administrative mess, because it’s hard to keep a comprehensive overview of all spending — which in turn has to be cleaned up by the financial department. They need to combine documents from various sources to create the full picture that’s required to comply with the financial department. Then there are the security issues. When your employees book on their own, they’re not giving their employer access to all travel information. The location where they’re staying, for example, isn’t necessarily shared with the office, which can have big consequences if something bad happens. In the case of an accident, a natural disaster or another security issue it’ll take a lot longer for the company to locate their employees, which can put them in a very dangerous situation. For financial, security and process reasons, the goal of a travel manager should be to increase the attachement rates. 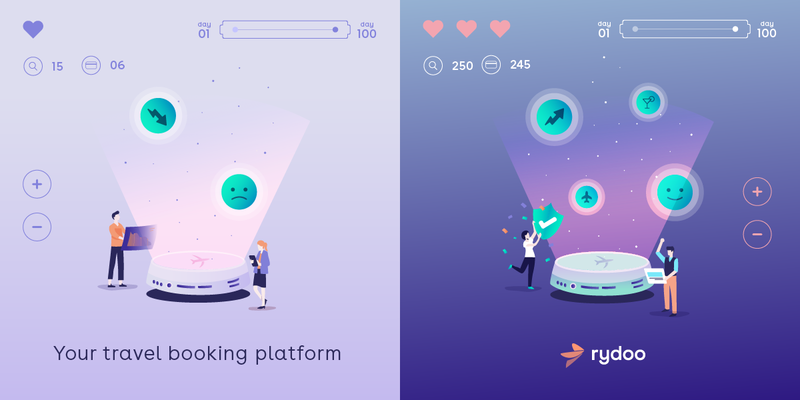 When we set out to create Rydoo, we wanted to make a new kind of booking platform — one that doesn’t have the same problems as others. There’s no reason why corporate tools have to look bad and be hard to use, so that’s why we’re mixing them with the design mentality of a commercial platform. It’s all about bringing the years of evolution in consumer tools to the corporate world, creating a platform that’s both intuitive and powerful. We make sure not to limit users to a small selection of flights and hotels, because that’s not what they want. Instead, we incorporate content from around the web, including the best deals from portals like Booking.com and Expedia — this way, your employees will actually find something they like. It’s all about bringing the years of evolution in consumer tools to the corporate world, creating a platform that’s both intuitive and powerful. We’re also constantly innovating and implementing new features and technologies, like artificial intelligence and machine learning. Rydoo already presents different users with tailored content, but we’re building a way to offer even better and more personal options, right when they need them. For us it’s not just about creating a better place for booking corporate trips — it’s about redefining the way you experience them from start to finish.